This entry was posted in iOS, Mobile Development, Programming, Web Development and tagged apache, database, dropbox, mysql, sync, wamp, web. Bookmark the permalink. Excellent article! Considering that I have four separate machines where I do development from! Just one thing: at the step 9, it only works with a trailing slash at the end of the path (like was mentioned at step 3: "Always use forward slashes here and include the trailing slash at the end."). Having made this observation, everything is working perfectly here, both in Dropbox as in GoogleDrive ! Thank you for this article, Randy ! So... Thanks for the article, Matt! Please disregard the line of above comment. Consider line 338 of the first comment and the observation of the second. Great How-To. Tried this process following a few other posts before I found this one. The others all skipped a couple steps and woudln't work. This one + $server_dir = “C:/wamp/”; worked perfectly!! Thank you very much, you have helped me a lot! Your text is very nice structured and clear. As guy before me said - you saved us from wasting a bunch of time.. Some error apears on index.php, on www directory. On config.inc.php file, on wamp/scripts directory, you may need to change the lines 4 to 7. 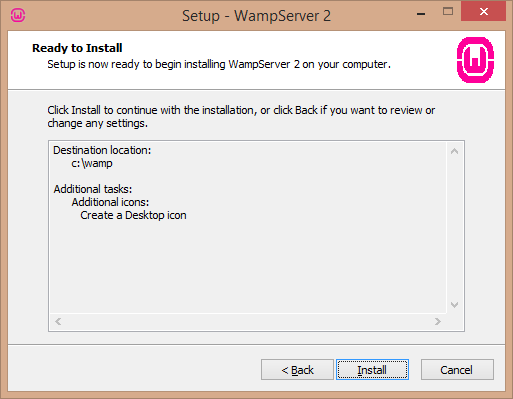 Change relative path ('../filename.ext') to absolute path of install directory of wamp ('C:/wamp/filename.ext'). Will this work with Box Sync too? 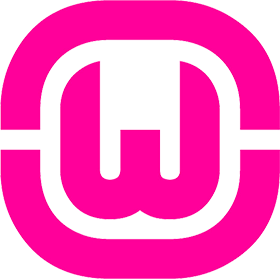 Although, when I click on "www folder on WAMP" it takes me to the correct place in my Box Sync folder. I've followed all steps but it still thinks it's on "c:/wamp/"
"WARNING: If you installed the 64-bit version of MySQL using WAMP, you MUST change line 26 of my.ini from [wampmysqld] to [wampmysqld64]." This does not work for me. The MySQL service will not start if I change the line. Any thoughts? before. So good to discover someone with some genuine thoughts on this topic. Hi, thanks for this great tutorial! Has anyone tried this kind of setup whilst using source control software such as GIT? How does the source control software on each machine cope with the file changes/commits made via a different machine? Does/can this kind of setup be a source for conflicts? happү to share my eҳpeгienxe here with collᥱagues. Somehow, I've got the database stuff to replicate, but all uploads are still pointing to the installed root, not the Dropbox version (and so only show up locally). Any idea what I might be doing wrong? After i follow all the steps why i came up with this error? I followed the instructions and used this to sync my Desktop and my Laptop so that I have the same Localhost at both the places. Sometimes I am having problem in my Laptop as Dropbox says 'Can't sync ib_logfile0 (permission denied)'. But this error never occurred in my Desktop. What is that file for? Can someone please help me. 1.) Change the physical location of these log files so that they do not need to be synced onto Dropbox by pointing them to a local file directory outside of the Dropbox folder. You can do this by editing the "my.ini" file (mysql\bin\my.ini) and changing the path for "innodb_log_group_home_dir" - Make sure the path already exists on your computer before changing it here and you should use an absolute path to point to a different location (e.g., "C:/Temp/MySQL"). Then these log files will only store locally and should not impact any other aspect of the databases; the data itself will still be synced via Dropbox. Make sure to restart MySQL after making the change. 2.) AND/OR pause Dropbox syncing on the active computer before starting the Apache/MySQL server. Then when you are finished working on the server for that device, shut down Apache/MySQL and enable syncing again. This will ensure that no files attempt to sync from both devices at the same time as can happen if you have the servers running on each and syncing data in real-time through Dropbox. It is a little less convenient but if you do experience any write conflicts with the servers running then this will help. 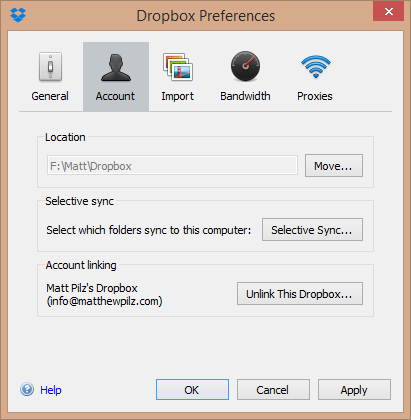 Dropbox is not great when it comes to syncing rapidly changing files from multiple machines and sometimes when it attempts to the files will be locked by other processes which can cause conflicts. hours in the break of day, because i enjoy to gain knowledge of more and more.